I want a hoverboard. You know, like the kind seen in the Back to the Future movies. I’ve wanted one since I was a kid. While we’re at it, I’d also like a warp drive engine to travel to the stars. And a time machine. Either the police box or the H.G. Wells version will do. These things have been in science fiction for years, so somebody should make it a reality. Soon. There are times when science fiction is remarkably prescient. Jules Verne told tales of humans traveling to the Moon in the 19th century, and by the mid 20th century it had become a reality. In the TV series Star Trek: The Next Generation, the crew use touchscreen tablets and communicate with the ship’s computer using natural language, which any smartphone will do today. At other times the predictions of science fiction are way off. 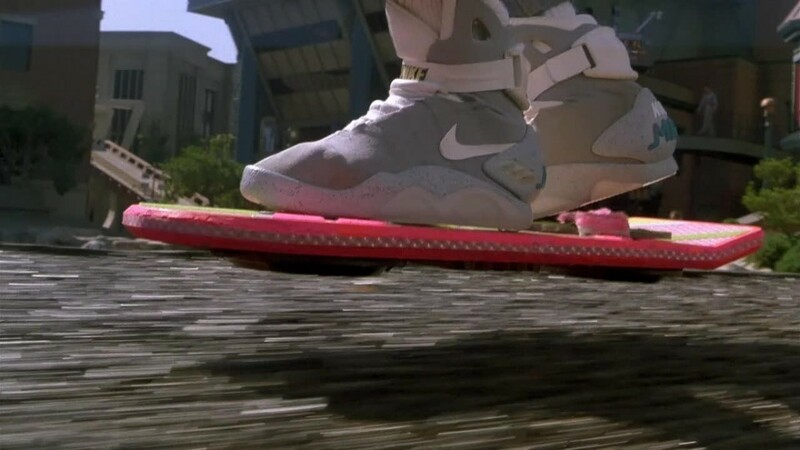 The chance of a McFly-esque hoverboard being developed in the next year is about as likely as the Cubs winning the world series. But why is it that some of our technological dreams become reality, while others remain works of fiction? Much of it has to do with the limits of the physics itself. Take, for example, warp drive. Star Trek’s favorite mode of transportation allows starships to travel among the stars much faster than light, so it is clearly not conventional physics. As its name implies, it seems to rely on warping space to allow for faster than light travel. The series is never entirely clear how it works beyond the fact that it relies of warp coils, dilithium crystals, and other things that can break down, threaten to explode or otherwise create drama. In 1994 Miguel Alcubierre published an article in Classical and Quantum Gravity titled “The warp drive: hyper-fast travel within general relativity.” This is a refereed paper in a respectable journal, so it’s not fringe theory, but that doesn’t mean warp drives are possible. What Alcubierre showed was that there are solutions to general relativity that allow for an object to travel at any arbitrary speed, even faster than light. It does this by compressing space in front of the object and correspondingly expanding space behind it. This means that while the object itself does not travel through space faster than light, space is warped around it such that the space the object occupies moves from point A to point B faster than light would. There is, however, a catch with this model, and it’s a big one. In the case of Alcubierre’s paper, his warp drive solution requires not only regular matter, but some kind of exotic matter with negative mass. All matter has positive mass, so it seems like the Alcubierre drive is only possible if we allow for a type of mass that doesn’t exist. So it’s an interesting idea, but without negative mass it’s not physically possible. Even My Little Pony had a time travel episode. Credit: Hub television. So what about time travel? It’s perhaps the most popular ideas in science fiction, and almost every sci-fi television series has at least one episode on the subject. Although often attributed to H.G. Wells, the idea of time travel assisted by gods or magical beings dates back centuries earlier. We now know through relativity that time can be manipulated. For example, the mass of the Earth curves space around it. The motion of anything near the Earth, such as a satellite, is changed because of this spatial curvature, as if there were a force of gravity acting on it. Since space and time are connected, the mass of the Earth also distorts time, which means a clock on the satellite ticks at a slightly different rate than a clock on the Earth. This effect on a satellite’s time is small (on the order of microseconds) but it is a measurable effect. In fact, the satellites of the global positioning system have to take this time distortion into effect in order to work properly. When you consider that the speed of light is around three hundred million meters-per-second, the difference of even a few microseconds can make all the difference in the world. If you’ve ever used a GPS receiver to find your way, you’ve counted on Einstein being right. In principle, time can be bent into a loop in such a way that it connects with its own past. If you found yourself in such a wibbly-wobbly space-time it would be possible to meet your younger self. Such a loop of time would be an actual time machine. As strange as this seems, there are examples of these time loops — what physicists call closed timelike curves (CTCs) — in general relativity. But just because CTCs can be described in general relativity doesn’t make them physically real: just because something is mathematically possible doesn’t necessarily mean its physically possible. In fact, most of the known examples require non-physical things like negative mass to work. 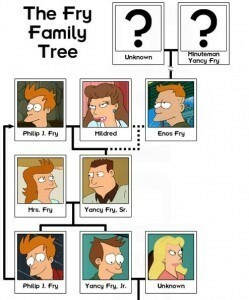 In Futurama, Phillip J. Fry is his own Grandpa due to a bit of time travel. Credit: Futurama. One possible solution to this paradoxical mess is to impose what is called the “self-consistency” principle. This requires that any “time machine” example must be self consistent. So the grandmother paradox mentioned above is forbidden because it is not self-consistent. What would be allowed is for you to go back in time and wound your grandfather. While in the hospital he meets a kindly doctor who turns out to be your future grandmother. So your trip back in time caused your grandparents to meet, which allowed you to be born. Perfectly self consistent. But this solution doesn’t prevent every problem. Suppose when you were 16 a stranger gives you a book. As you read through the book you find it is a set of instructions for building a time machine. It even includes all the background physics necessary to make it work. You go to college, study physics, and your doctoral dissertation is on the physics of time travel (which you got from the book). This groundbreaking work wins you the Nobel prize, and with the prize money you build a time machine, travel back in time and present your younger self with the book on time travel you once received… from yourself. A similar idea was used in the TV show Futurama, where Phillip J. Fry travels back in time and is wooed by a young woman who it turns out is his Grandmother. So Fry inadvertently becomes his own Grandpa. These scenarios are self consistent, but we seem led to ask where the book came from. Yes, you got it from yourself, but that doesn’t seem to be a satisfying answer. What about Phillip J. Fry? The only answer is that Fry is part of a closed timelike curve. He doesn’t have an origin. He just is. Various theories have been proposed to provide a more satisfying answer to examples such as this. They invoke aspects of quantum mechanics, thermodynamics, entropy, information theory, and on and on down the rabbit hole. None of these models provide a completely satisfying description of time travel that makes sense. This is why most physicists figure time travel is impossible. There isn’t a clear way for it to make physical sense. Stephen Hawking went so far as to propose a chronology protection conjecture, which proposes that all macroscopic CTCs are physically impossible. Okay, but what about the hoverboard? All it needs to do is float against the weight of gravity. Superconductors can levitate magnets through induced electric currents, known as the Meissner effect. So what about in general? Is there a way to counter the effects of gravity to have floating devices? Although it seems tantalizingly close, the coveted hoverboard is actually the most physics-violating idea of the bunch. When a magnet is levitated above a superconductor, the two actually push against each other. The electromagnetic force of the superconductor keeps the magnet in the air, while the magnet’s magnetic field pushes down against the superconductor. The same is true with other “levitating” devices such as helicopters, where the helicopter blades push down on the air to keep the helicopter up. This is a fundamental principle of physics, known as Newton’s third law of motion. For every action, there is an equal and opposite reaction. But the hoverboard would seem to violate this law. It simply floats despite the force of gravity pulling down on it. The same idea holds for floating spaceships and the like. Somehow they simply cancel the force of gravity without inducing any force in return. As far as we know, there’s no way to violate Newton’s third law. But if we had hoverboards that could, then all the other science fiction ideas would come into place. Hoverboards could be used as reactionless drives for spaceships. This would allow us to cancel a spaceship’s inertia, thus allowing it to warp between the stars faster than light. Of course, if we can travel faster than light, we could create closed-timelike paths, thus solving the time-travel problem. With a hoverboard the entire universe would suddenly easily be within our reach. But those pesky laws of physics — not our lack of imagination — are what prevent us from creating one. Note: This post originally appeared at Starts With A Bang!